Any dealer or collector eventually gets excited about a purchase, overlooked by others. This is a case in point, it was purchased at public auction. If size counts, and some say it does, this spoon must be considered as important being almost 37 cm long. It was made about 1730 by Johann Wagenknecht in Augsburg Germany. 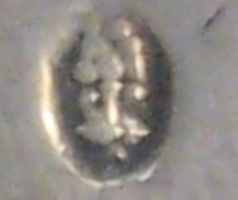 Coin like medallions on early German silver are not rare. It seems obvious that silversmiths when supplied by clients with coins sometimes decided to use them as decorations in the finished product. 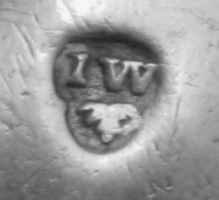 If anyone picked the earliest date when silversmith first used an ancient Roman coin as decoration, someone else would find an earlier example. At some later date the style was still popular, but coins probably became less available, so easily cast coin like medallions were used. In Germany large repoussée medallions of Roman Emperors were common on beakers in the 17th c., presumably because Germany was the home of the revived Holy Roman Empire. 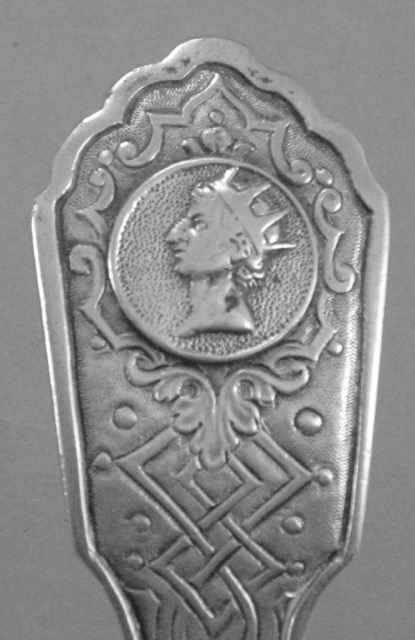 In about 1720 the fashion again flourished and for the next 15 years medallions could be found on flatware and hollowware especially in France and Germany. Most French medallions were busts of men or women, but not necessarily Roman Emperors. In Augsburg, a town known for its production of flatware, they often made flatware pieces with smaller coin-like medallions. But this one is a bit unusual. The image of the emperor wearing a radiant crown is easily recognized as Augustus. Augsburg was named after Augustus, and while some might not know it, every Augsburg citizen would recognize the emperor from his statue in the fountain in front of city hall. So the silversmith may have used this particular medallion as a matter of civic pride. Unfortunately the coat of arms has defied tracing, although it does appear oddly similar to that of the city of Hamburg. The last question is why this piece is so rare. Selling only shows two large spoons, and one large medallion ladle. 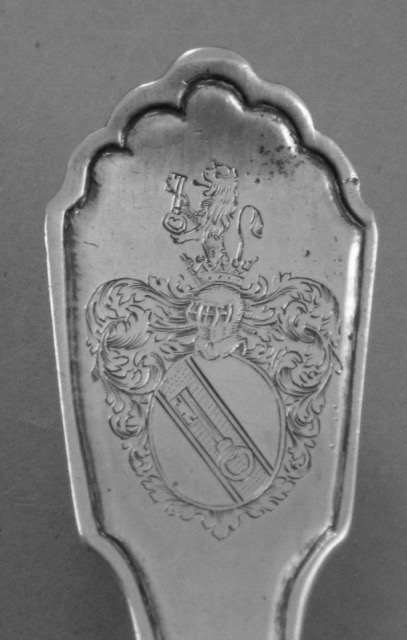 In Klaus Marquardt’s book on an extensive European flatware collection no large Augsburg spoon is shown, even though the title of one chapter is "Augsburg Silver Cutlery 1580 to 1807 A Chapter Of Its Own. " Of course 17th and 18 c. Augsburg beakers are far from rare, so why so few large spoons or ladles. There is no shortage of 19th century German stuffing spoons, far from it. My proposition is that these large flatware pieces weighed as much and probably much more than a beaker, and were less easily hidden or less portable in time of danger. Obviously medallion flatware did not disappear in 1735, in a sense, it certainly never lost popularity. Its biggest revival was probably in America in the mid 19th century when companies like Tiffany and Gorham again made medallion pieces, some using coin like medallions of Roman emperors.